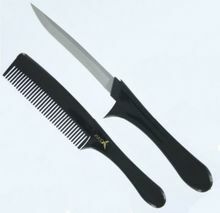 It looks like an ordinary comb, but the handle is actually a highly effective steel dagger\knife! The blade is 3.25 inches long. With its innocent appearance and obvious usefulness (after all it is a real comb), this is the answer to personal defense at home at work or overseas. As a comb it�s particularly appropriate when carried in a glove compartment, travel luggage, or a woman�s handbag and will look perfectly natural in virtually every room in your house. Do not take on airlines. Great self defense tool that will also tame a rowdy head of hair. Ladies, if the time came to actually use this item, you will need to stab very hard, It will be effective and cause a lot of pain, but you have to apply it very firmly. You might want to practice on an old sofa cushion (one that you will be throwing away).